I just came from my paper garden with a container full of delicious fruit! This is a perfect example of how a small transformation applied to an existing model creates a new one. David Donahue studied a small bell decoration* designed by Paul Jackson, and, by devising small flaps that show the other side of the paper, added some “leaves” and created a strawberry. Using red and green paper and rounding the tip just a bit the result is a sweet and succulent origami treat. Bravo, David! 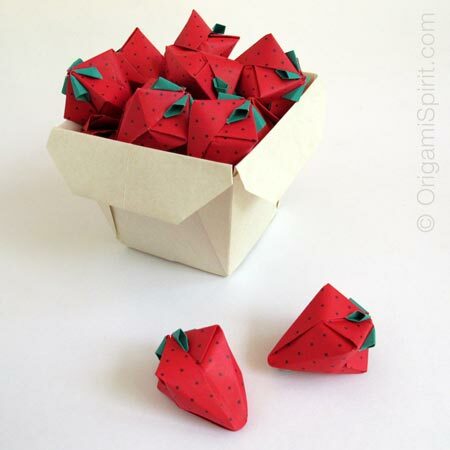 Here is a video showing how to make David Donahue’s origami strawberry. And here is a link to the video showing how to make the box for the strawberries. Now the question: Who’s up for designing some origami whipped cream to go with this strawberry? I made whipped cream it looks great!!! Great Adrian, thank you for sharing. I hope your cousin liked it! My first fruit turned out to be terrible. I think I need practice. Practice make the master, persist, you’ll get there! I just finished another strawberry. It looked a little better! As always … a wonderful video tutorial. You are such a good teacher. What a fantastic design as well. Thank you also to David Donahue for sharing his creation! Great tutorial, thank you for sharing it. Thank you Leyla! Well done video and directions… they look tasty in the box! Thank you David for your permission to share it in a video!